At the on-going Consumer Electronics Show 2011, gaming peripheral maker Razer demonstrated a concept tablet that has got everyone quite excited. Razer Switchblade is a gaming tablet concept that consists of 7-inch ultra-sensitive touchscreen and a keyboard with 45 tactile LCD keys. It looks like a netbook but is termed as a tablet. This concept tablet is powered with Intel Atom processor since it was created in collaboration with Intel. 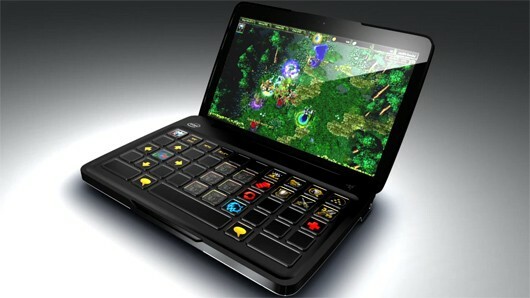 Razer Switchblade tablet concept shows brilliant design aesthetics with its black colored chassis with glossy display. It immediately reminds of the Toshiba Libretto W105 tablet, but is different in a number of ways. The 7-inch glossy capacitive touchscreen supports 1024x600 pixel resolution and is prone to carry fingerprints. It carries the 45 tactile LCD keys can change backlight colors and show key icons in gaming mode. The full tactile keyboard offers adaptive on-the-fly control and display support, which makes it easy for using both animated keys and static keys for regular purpose, and gaming specifically. Switchblade comes loaded with a Windows 7 operating system copy. Under the hood is an Intel Atom processor that powers the Switchblade, but we aren't aware of specifications of the graphics added to it. Wireless Internet is promised with Wi-Fi and 3G Network support integrated. For physical connectivity, the tablet offers mini HDMI, USB 3.0 and standard headphone-mic ports. So if you miss the mouse you can always attach your favorite Razer or any other gaming mice to it and continue gaming.